Cowboys and cattle are as different as the geography they inhibit. From the Great Basin to the Sandhills of Nebraska; the forested Rockies of Montana to the swamps and marshes of the deep south. The differences in the way cattle are worked, raised, handled, sold, and bred, change from operation to operation and region to region. 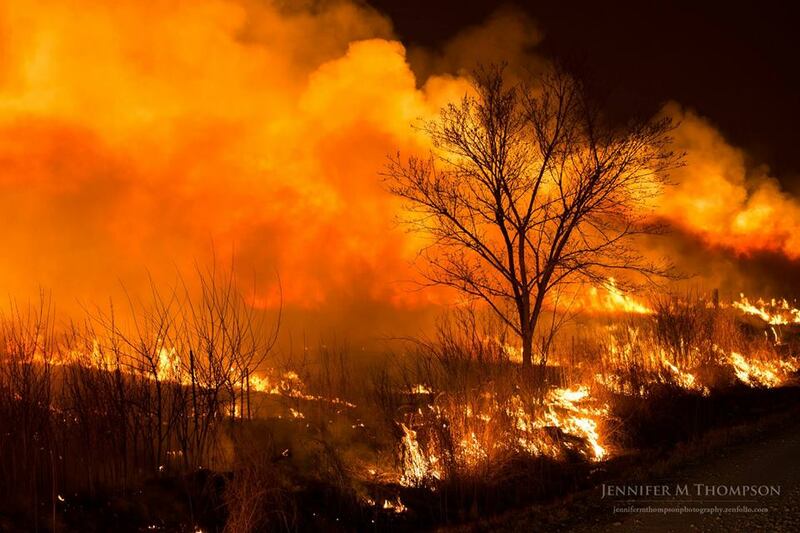 Here in the Flint Hills of Kansas, one of our most distinguishing cattle ranching marks is fire season. The last tallgrass prairie in America Flint Hills are known for its high protein bluestem grass, that packs pounds on to cattle. Little bluestem, the state grass of Kansas, can provide 1-2 tons of forage per acre and is especially palatable to cattle after a spring burn, when plants are re-growing. So every spring, along highways and back roads, smoke billows from acres and acres of grass fires, as ranchers are preparing the land for their shortened and intense 90-day grazing season (more head of cattle/fewer days). When Grandpa used to burn his pasture, my favorite part happened about three or four days afterward. When the flames had cleared the thatch, the dead undergrowth, and saplings, revealing shed antlers, skulls, and all other sorts of surprises. That’s why I haven’t burned my pasture yet…Im scared of what I might find. There’s the massive cemetery cross from a few years back. Then the horse skeleton from last year. I know there are some mower decks, probably some implements, maybe a Model A or something. Fire has a way of revealing things that were once hidden. Three months of marching had led the fledgling nation of Israel to the foot of Mt. Sinai. (Ex. 19.1) Their extended camp-out would be marked and defined by the conversations they would have with God during this time. Moses had hiked up and down the mountain a few times, each time carrying a message from God who has manifested Himself atop the mountain by cloud, storm, and fire. When they “saw the thunder and lightning and heard the trumpet and saw the mountain in smoke, the trembled [nua’] with fear.” (Ex 20.18) The people, at the sigh of God’s presence on the mountian, and in the hearing of his voice, milled around with apprehension. They became restless [nua’ — Gen 4.14]; they staggered like a drunk nua’ — Isaiah 29.9] and shook like a tree in the wind [nua’ — Isaiah 7.2]. Shaking with fear, they keep their distance from the mountain and ask Moses to do the talking for them. Testing doesn’t always conjure up positive feelings or thoughts. This story (and the other stories in Scripture where God tests his people) makes me uncomfortable. At first glance, these stories seem to reek of entrapment. God in His divine wisdom and providence, provides the very thing that He knows will trip us up! Seems kind of underhanded for a good and loving God. It’s like he’s sitting on a cloud, waiting for us to screw up, expecting us to mis-step. With this kind of thinking, its easy to see how people would have trouble believing in the goodness of God. Testing at the hand and will of God, shouldn’t have a connotation that impune the virtue of the Lord. Perhaps a better look at “testing” throughout scripture, especially as seen in the wilderness wanderings, will allow God to remain good and “test” to retain its important implications. First off, testing, especially in the wilderness narratives, was all about the response. In the same way that an academic test’s purpose was to elicit an intellectual reaction, so the testing of the Israelites response was intended to be a closer relationship with the Lord. The testing was there for the benefit of Israel, not failure. The testing of Israel, was to their benefit. Will is found only when challenged; strength discovered when challenged. During its time, Israel had its share of tests? And not all of them were tests of desperation. The wilderness tests weren’t all bad, a plague or destruction (like Job), sometimes testing can be of affluence. The Israelites were “tested” with manna from heave (Ex. 16.4, 15-16; Deut 8.16) and double on the 6th day (Ex 16.29). They were “tested” with the Lord’s presence (ex. 20.20) and meat every morning (Ex. 16.8). When they left Egypt, they wanted to know that God was going with them. So God led them all the way in the desert, what they desired, as a test (Deut 8.2). Thoughts of testing usually happen in the valley’s of life, cancer diagnosis and debt, divorce and rebellion, but tests hit the Israelites at the good times as well. Affluence can bring out the worst in folks. Israel at manna and meat to see if they would pay attention to his commands (Ex 15.26); live of His daily provision (Ex 16.4, 16); keep the Sabbath (16.5); and trust Him at His word. Up to this point the word that has been translated as “testing” has been the Hebrew word nasa’. Thirty six times in the Old Testament, throughout the scope of the Hebrew Bible, this word was used to communicate a situation in order to reveal motives and attitudes of the heart. But there is another word, however, that is more poetic and metaphorical for this process of getting to know deeper issues. The Hebrew word bachan, is largely used later in the Hebrew Scriptures and is clustered in the writings of the prophets and the wisdom books. In the same way that gold or silver is refined, so too does the Lord test the heart. Six different times (Job 23.10; Ps. 66.10; Prov 17.3; Judges 6.27-30; Jer. 9.7; Zech 13.9) is the word used in connection with the understanding of metallurgy: a refining fire, bringing impurities to the surface, heat to shape and mold. While in the fire, being tested, the heart’s contents are shown. In Exodus 20.20, Moses tells the people the God has come to “test” [nasa’] them. God had descended on the Mountaintop, spoken with the nation of Israel from atop the mountain, and given them the 10 commandments. They had been told ‘not to go up the mountain or touch the foot of it” (Ex 19.12), and now they were committed to following His instructions. They told Moses to speak them instead of God. God’s presence came to reveal what was in their hearts concerning Him: fear and obedience. The test had come and had revealed. Testing is God’s way of helping us; helping us realize and uncover the motives of our hearts in order to better understand our relationship with Him. How are you holding up under the fire?